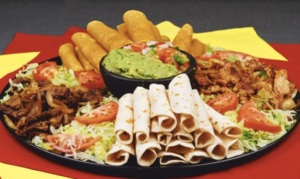 With a variety of flavors and spicy ingredients, Mexican foods represent a culture that dates back to the ancient Olmec, Maya and Aztec civilizations. Chili peppers, chocolate, avocado, beans, corn and rice represent traditional components of Mexican cuisine. In northern Mexico, meat dishes are popular, while the south tends to rely heavily on chicken and vegetables. Contemporary dishes combine the influences of early settlers and distant cultures, including Caribbean, French and Spanish. Originating in Mexico, these folded corn tortillas — some rolled around small fish — have been traced by anthropologists to the cuisine of indigenous people living in the lake region of the Valley of Mexico. Today, enchiladas are baked corn or flour tortillas smothered in sauces spiced with chili pepper and other ingredients. 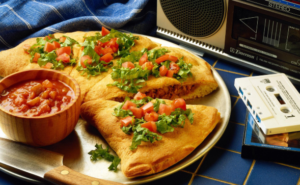 Typical enchilada ingredients include meat, cheese, beans, vegetables, potatoes and seafood. The taco possesses a history that dates to before the arrival of Europeans in Mexico. Traditionally, a filling is placed inside a folded or rolled corn (or wheat) tortilla. 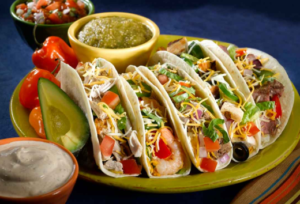 Nowadays, the versatility of tacos includes fillings such as beef, vegetables, mutton and shellfish. A popular variation of the dish is “tacos de pescado” (fish tacos). In Baja California, Mexico, grilled or fried fish is placed on top of a tortilla with pico de gallo, sour cream and lettuce or cabbage. Inside a small rolled-up corn or wheat flour tortilla, ingredients like beef or chicken fill the inside of a taquito before a dip in hot oil. Measuring about six inches long, taquitos differ from tacos because they are generally thin and crisp-fried after preparation. Regional variations in Mexico combine cheese, pork, potato and vegetables with cabbage, sour cream, red chili salsa, and crumbled Mexican cheese as typical toppings. A breakfast taquito may include potatoes and eggs. One of the most popular Mexican foods worldwide is guacamole. Accompanying tortilla chips, tacos and hamburgers, guacamole gets its distinctive green color and consistency from a combination of ripe avocados, onions and salt. Adding lime or lemon juice contributes flavor and slows down discoloration of the dip. Other typical ingredients in guacamole include minced tomatoes, garlic, black pepper, sour cream and fresh cilantro. A cultural tradition lasting for centuries, salsas elevate the taste and purpose of Mexican foods by adding color to a dish or serving as a versatile topping. Blend raw ingredients with a “molcajete” (similar to a mortar and pestle), the traditional salsa cooking technique. Depending on whether it is chopped by hand or mixed in a blender, salsa can have a chunky or smooth consistency. Popular variations include pico de gallo (with chili peppers and cilantro leaves) and mango salsa, a popular topping for grilled chicken or fish. Cheese is the primary ingredient of a quesadilla. To make the popular Mexican snack food, place cheese and other ingredients between two corn tortillas. Bake until the cheese melts. Quesadillas are circular and after cooking can be cut into four or six triangular pieces, like a pie. Popular ingredients in Mexican quesadillas include chicken, steak, cooked vegetables, salsa and mushrooms.